As has been the case throughout the tournament thus far, team Sweden got out to a slow start in its game against team Slovakia. But as has also been the case throughout the tournament, the team’s success didn’t suffer as a result. Sweden’s power play has been average at best – as evidence by its ranking of ninth out of the total 16 teams – but came through in a big way in the first period. The Swedes’ first goal came midway through the period as Gustav Nyquist scored in the dying seconds of the team’s first PP. That was followed by another powerplay goal – this time from Mikael Backlund, assisted by Joakim Lindstrom – with 11 seconds remaining in the period. All in all it wasn’t one of the best periods in Slovakian forward Ladislav Nagy’s career as both Swedish goals came as a result of the two penalties he took. The second period was much less exciting on the score sheet as only two penalties were called and just one goal was scored – despite a combined 25 shots between the teams. But the Slovaks were able to trim the lead thanks to a goal by Martin Marincin, with assists by Martin Reway and Tomas Tatar. Any thoughts of a Slovakia comeback were quickly put to bed in the third period as Magnus Nygren scored two minutes into the period, assisted by Linus Klasen. That was all the offense the Swedes needed as they directed 40 shots at Slovakian goalie Jaroslav Janus, while Anders Nilsson stopped 20 of 21 shots. One noticeable difference from this game and all but one of Sweden’s other games was the fact the win came in larger than a one goal margin. With the exception of Sweden’s 3-0 win against Denmark to open the tournament, all of its wins had been by one goal margins. 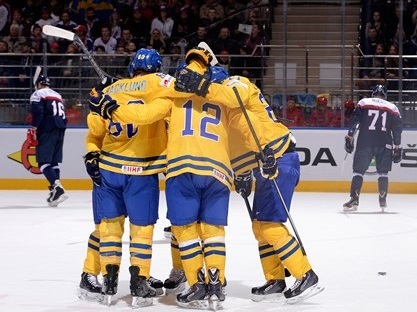 The way the team won should also act as a huge confidence booster for the Swedes as they head into their game against Canada on May 18. To dominate from beginning to end, put up the number of shots they did and have a bit of a cushion on the scoreboard will do wonders for the team. Sunday’s game will also be a battle for first place in Group A as Sweden and Canada sit 1-2 respectively with a slim chance of either falling below the second seed.